There are a number of models available suitable for grassed areas of between 1 and 5 acres - we are happy to advise. If you live in Wiltshire visit our showroom. We will deliver free of charge, fully assembled and ready to go. It is a good idea to test drive a zero turn mower before buying. Zero Turn Ride-on Mowers are ideal for manoeuvring around obstacles such as trees, shrubs, awkward flower beds or a shaped lawn. Turning 360 degrees on the spot means that you can turn more quickly and continue to mow new grass rather than go over grass you have already just mowed. Therefore, compared to other tractor mowers they are a lot quicker and can save up to 50% of normal mowing time. The Toro ZS5000 Timecutter features a twin hydrostatic transmission that allows you to control the s..
Cut your mowing time down by at least 30% with this Swedish designed Zero-turn Mower. The Stig.. 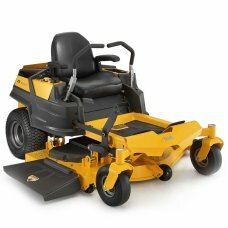 The Snapper ZTX250 will prove the ideal partner for tackling large overgrown grass areas thanks to i..